London South Bank University (LSBU) Motorsport was represented at the global Formula Student competition, run by the Institution of Mechanical Engineers and taking place at Silverstone Circuit last month. The competition, now running for 20 years, saw more than 2,000 students from 24 countries travel to Silverstone on 20-23 July. 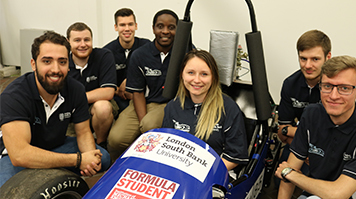 A team of 13 of LSBU’s engineering students worked tirelessly to create a vehicle from scratch to compete on the track, with a book of compliance requirements more than 150 pages thick. While the team’s car didn’t make it on the track, falling short on just two criteria, the team were still satisfied with their performance. “Most teams have around 25 students, and we had just 13 students, so we did well to get so close to qualifying,” said Magdalena Grzybek, one of the team’s student engineers. Michael Gore, another of the student engineers, said Formula Student offered more than just a chance to prove engineering knowledge and skills. “It was competitive, but there was still a great atmosphere with a sense of camaraderie and sharing and we learnt a lot from other teams who had more experience than us,” he said. "We also were able to be face-to-face with important people from companies we'd never usually get to be around." The main Class 1 competition saw 19 electric vehicles and 73 cars with combustion engines compete, with Cardiff University winning the title. “It was a superb competition overall… all teams seemed to really enjoy themselves. Read more about LSBU’s courses in mechanical engineering.